Gracie is out of CH Akylah Lallante (Grace) and Aust. 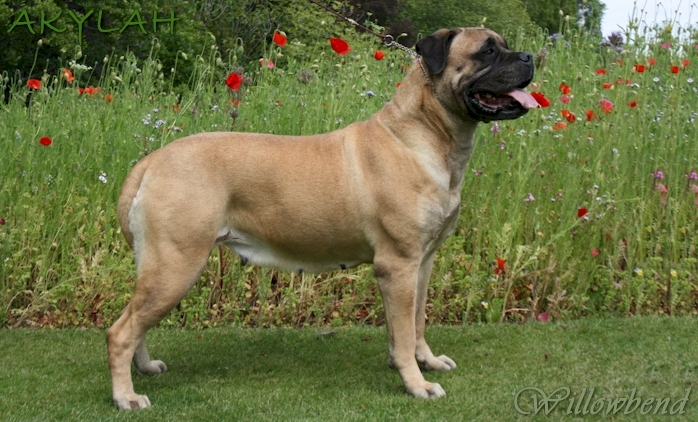 CH Bullmaster State Trooper (Phoenix), and from the first double sire mating to take place in New Zealand, and the first planned and successful double sire Bullmastiff mating in Australasia. Gracie is co-owned by Akylah Bullmastiffs and Willowbend Bullmastiffs, New Zealand. Gracie is full of life, a very playful, cheeky and energetic girl, but also very sweet and loving; she enjoys having cuddles and any attention that comes her way. She has been DNA profiled, parentage certified, and had her eyes cleared by a specialist ophthalmologist. Gracie's hips are R03/L07=10 and elbows 1/1.